Campbell Brown, Facebook’s head of news partnerships, reminded publishers attending American Magazine Media Conference this week that the social network doesn’t exist to save them. The sooner that publishers view Facebook as a ruthless competitor, the healthier they will be in the longer term. 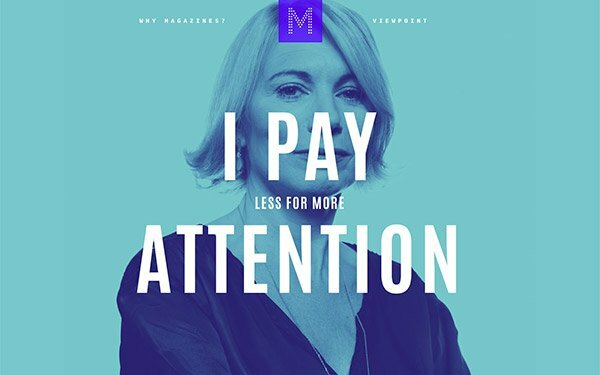 That’s why it’s refreshing to see Magnetic, the U.K. trade group for consumer magazines, working to defend the interests of publishers with its new “Pay Attention!” campaign. The group is touting research showing magazine readers are more engaged with content than users of social media and TV viewers. Magnetic is launching the campaign as magazines face another year of falling revenue amid a U.K. ad market that’s forecast to expand 4.9% this year, according to the Advertising Association and Warc’s expenditure report. That growth contrasts with a 6.2% projected decline for magazines, following a 7.5% drop in 2018. Anyone like me who has seen their teenage kids swipe through hundreds of Instagram posts and Snapchat stories on a smartphone while watching "The Masked Singer" on TV will appreciate the significance of Magnetic’s research on the attention economy. The group’s consumer survey found 58% of magazine and 60% of newspaper readers aren’t doing anything else while they browse publications. In contrast, only 30% of TV viewers and 35% social media users said they give their undivided attention to what they’re seeing. Also, 57% of respondents said they think positively about magazine advertising, describing it as part of the experience, the highest score for any media platform. Magnetic’s report also cites other research about the positive psychological effects of immersion and undivided attention to a single task like reading. It’s time for publishers to focus on the benefits they provide to advertisers and their audiences, rather than envy Facebook’s billion-dollar revenue gains and suffer through dull lectures from Campbell Brown. If it makes anyone feel any better, the social network faces its own threats. This year, for the first time, it named Amazon fas a rival in the digital ad market. No one wants to compete with Amazon. Regulators and lawmakers worldwide are scrutinizing Facebook’s failures to safeguard consumer privacy amid broader fears about the company’s role in undermining social cohesion. Ultimately, Facebook’s greatest threat comes from within its ranks of tone-deaf executives who brought so much public enmity upon themselves. It’s long past the time for them to pay attention.